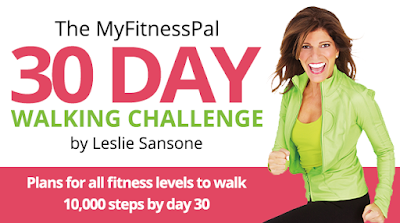 Be FiT: 30-Day Walking Challenge, Who's In? I just stumbled on an article on a Leslie Sansone's 30-day walking challenge and I fell deeply in love with it. Since I am recuperating, I have been looking for an exercise that would be mild with me and enough to work me and I think this is just the bomb. The program has 3 versions i.e. ranging from beginners' steps, intermediate and advanced. I am starting today and will love to have an "accountabilibuddy" (new diction for an accountability buddy) - partner in workout - I wouldn't mind a virtual buddy either. Leslie Sansone can be a boring instructor to me but I need her on days as this when I can't cope with a Shaun T or a Billy Blanks high impact exercise. A new discovery is Jenny Ford, I love her steps aerobics and I will get the videos to help me out in a recovery process. Oh! How I had missed the videos and all the plans to lose weight in a healthy way, the body has it's way of declining (today makes 28 days since illness) and I cannot wait to try the first video in weeks. Walking with Leslie, Jenny and Jessica is my way of recuperating afterall.